Reabracadabra_Kac.jpg: Reconstruction of Eduardo Kac, Reabracadabra, 1985. Animated poem for Videotexto. Photo courtesy the artist. Skinonskinonskin.jpg: “freezing” from Entropy8Zuper! (Auriea Harvey and Michaël Samyn) skinonskinonskin, 1999. Website. 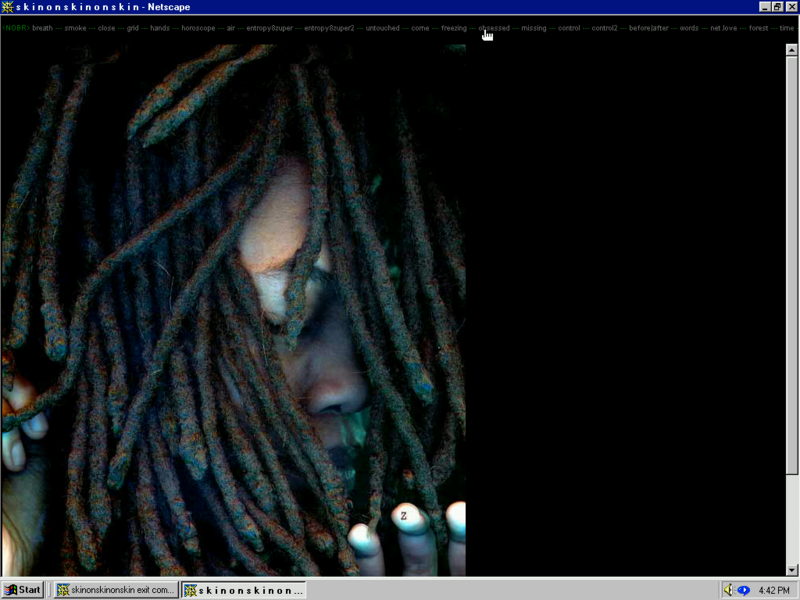 Screenshot, 2017, Netscape Communicator 4.7 for Windows98, entropy8zuper.org/skinonskinonskin/rhizome. Rhizome, the art organisation that is an affiliate of the New Museum in New York, is currently hosting the online exhibition “Net Art Anthology” as part of the exhibition “The Art Happens Here: Net Art’s Archival Poetics.” The online exhibition features works by Dutch artists JODI (Joan Heemskerk en Dirk Paesmans), Harm van den Dorpel, Constant Dullaart, Mouchette (Martine Neddam) and Rafaël Rozendaal. 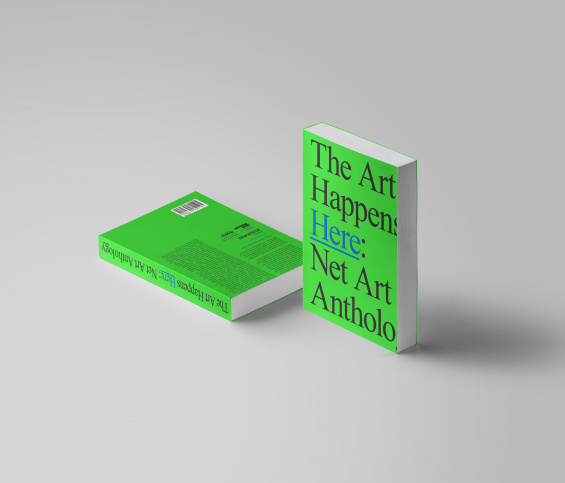 Dutch curator and author Josephine Bosma has been pivotal in the creation of the catalog: “The Art Happens Here”Net art Anthology.” Find more details on the exhibition and catalog below. 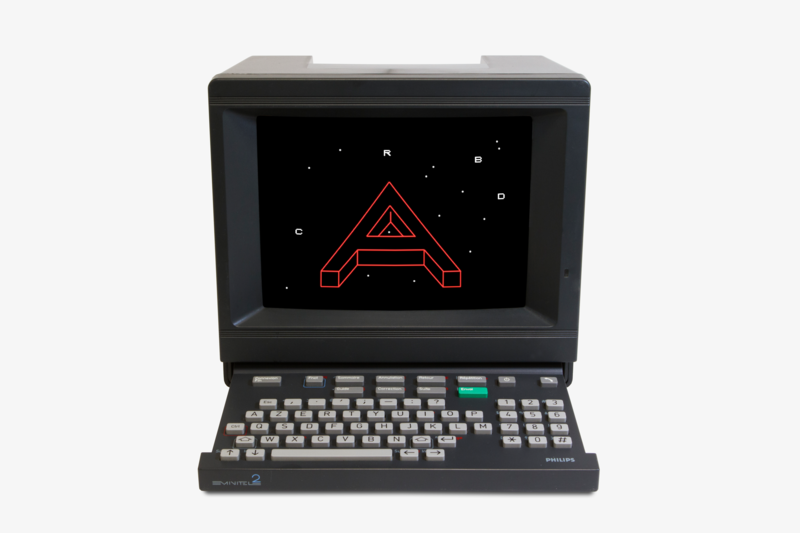 Rhizome presents “The Art Happens Here: Net Art’s Archival Poetics,” curated by Michael Connor, Artistic Director, Rhizome, with Aria Dean, Assistant Curator, and on view from January 22 to May 26, 2019, in the New Museum’s Lobby Gallery. Presenting sixteen artworks selected from “Net Art Anthology” (anthology.rhizome.org)—Rhizome’s major online exhibition of one hundred works from throughout net art history, which proposes a possible canon for net art—the exhibition culminates this two-year research and preservation initiative, leveraging Rhizome’s unique expertise in the history of network culture and the display of born-digital art. Dating from 1985 to the present, the works in “Net Art Anthology” and “The Art Happens Here” make use of a wide range of mediums—including websites, software, sculpture, graphics, books, and merchandise—and represent a historical perspective on the breadth of net art practice. The artworks also offer distinct approaches to a central problem inherent in net art: how to come to terms with a dynamic, rapidly changing network culture while also actively participating in it. More than just the creative use of the internet, net art involves diverse practices that “happen” via encounters among users and machines on and through networks. Its live, performative quality means that questions regarding its archival status often emerge—at the point of a work’s creation, when it is taken up by an institution, or in response to changing technological circumstances. How can net art be made to last without losing its variability? How can it be reperformed and recirculated as network contexts change? How can we note its absence or loss? JODI, or jodi.org, is a collective of two internet artists: Joan Heemskerk (Bogotá) and Dirk Paesmans (Caracas). Their background is in photography and video art; since the mid-1990s they started to create original artworks for the World Wide Web. A few years later, they also turned to software art and artistic computer game modification. Since 2002, they have been in what has been called their “Screen Grab” period, making video works by recording the computer monitor’s output while working, playing video games, or coding. Constant Dullaart’s often conceptual work manifests itself both online and offline. Within his practice, he reflects on the broad cultural and social effects of communication and image processing technologies while critically engaging the power structures of mega corporations that dramatically influence our worldview through the internet. He examines the boundaries of manipulating Google, Facebook and Instagram and recently started his own tech company Dulltech™ with Kickstarter. Martine Neddam is a visual artist who has been working with internet virtual characters who lead an autonomous artistic existence in which the real author remains invisible. She has been exploring anonymously the concept of online identity through virtual characters such as Mouchette, David Still, XiaoQian, and the shared interface virtualperson.net. With MyDekstopLife she continues investigating identity in a browser by developing an original visual style and an inner voice. Rafaël Rozendaal (b. 1980, Netherlands) is Dutch-Brazilian artist who uses the internet as his canvas and as his studio. His websites attract 40 million visits per year. His practice also consists of installations, lenticular paintings, tapestries, drawings, writings, lectures, and a podcast. He is the creator of BYOB (Bring Your Own Beamer), an open source DIY curatorial format. Most recently (2018) Generosity, Rozendaal’s solo exhibition, took place at Towada Art Museum in Japan. His work is currently included in Programmed at the Whitney Museum of American Art and in a show of recent acquisitions at the Stedelijk Museum on Amsterdam. Rafaël Rozendaal’s first major monograph Everything, Always, Everywhere was published in 2017 by Valiz, Amsterdam. The exhibition will be accompanied by a fully illustrated catalogue edited by Connor with Dean, which will include entries on each of the one hundred artworks in “Net Art Anthology” along with contributions by Josephine Bosma, Paul Soulellis, manuel arturo abreu, and others. 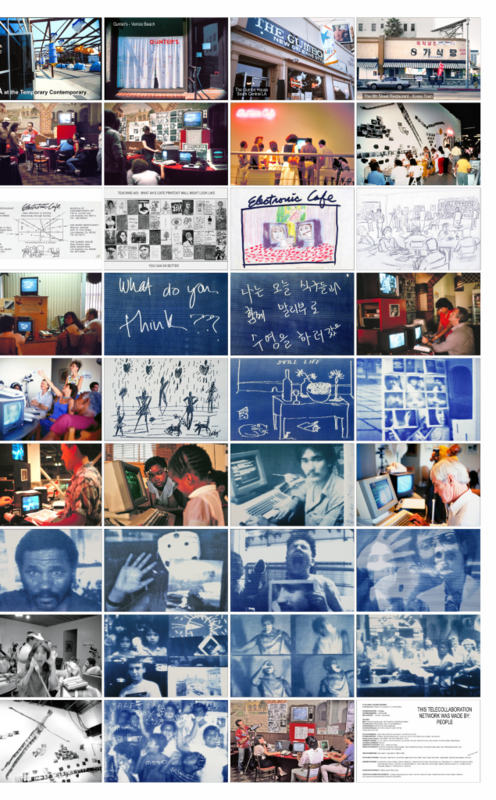 The richly illustrated catalog and book retells the history of net art from the 1980s to the present through thematic essays, interviews, and museum-quality screenshots. The book was made in collaboration with Dutch art crurator and theorist Josephine Bosma, and features the work of the aforementioned Dutch artists. You can find more information on the book on the New Museum website here. On March 21st, 2019 art critic and theorist Josephine Bosma will be giving a lecture as part of the Rhizome project in “Let’s Talk Net Art: Art and the Network Before 1989.” Bosma will show how exploring early history brings net art, in her words, “into focus as a hugely diverse field in which online and offline works and practices intermingle and co-exist, while older strategies and technologies never really die.” Find more information here. Josephine Bosma is a critic and theorist living and working in Amsterdam, the Netherlands. She specializes in art in the context of the Internet. From 1993 her work initially appeared as radio reports and interviews on Radio Patapoe and VPRO. In 1997 Bosma became one of the key figures participating in and molding the then new sphere of critical Internet discourse (and practice) taking place in email lists such as Nettime and Rhizome. 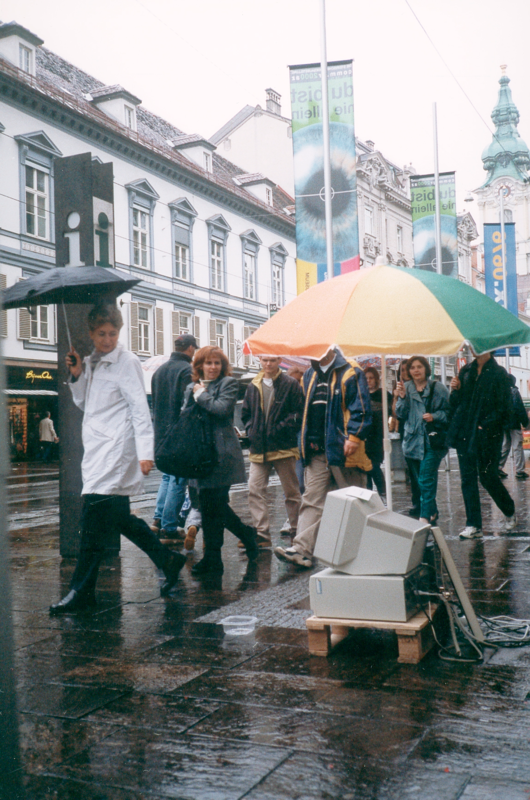 Since then her writings on net art and net culture appear in numerous magazines, books and catalogues, both on- and offline, from Ars Electronica, Telepolis, Mute, and DU to Metropolis M and Frieze D/E. Rhizome champions born-digital art and culture through artist-centered programs that commission, present, and preserve art made with and through digital networks and tools. 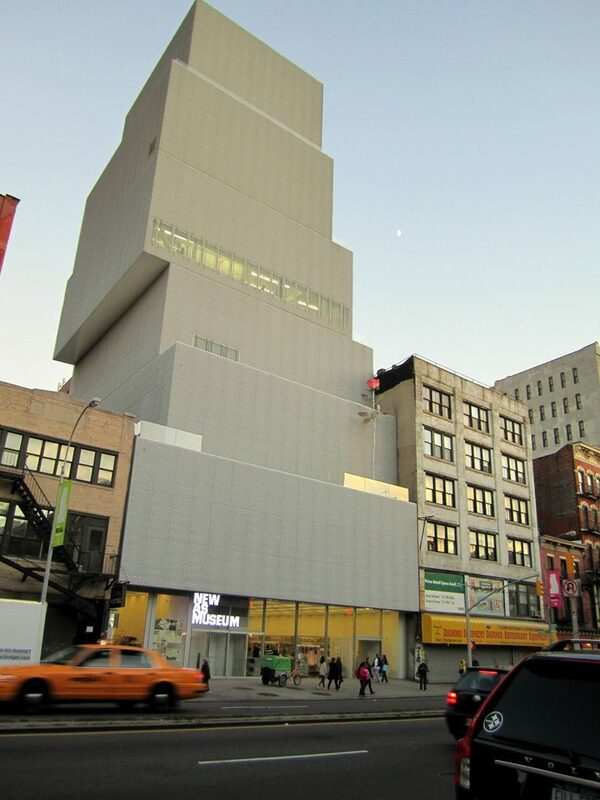 Online since 1996, the organization is an affiliate of the iconic New Museum in New York City. For more information, visit rhizome.org.